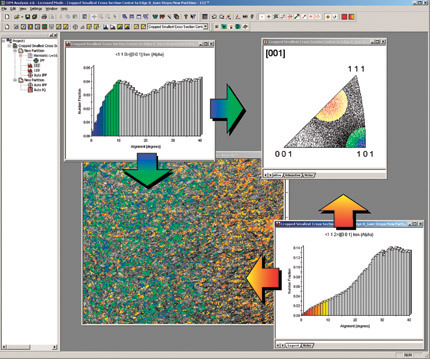 EDAX OIM™ Data Analysis software is a simple-to-use, yet powerful offline tool for microstructure analysis. It holds virtually unlimited potential for interrogating the wealth of information contained in OIM™ Data scans. The software’s ease of use and advanced visualization tools make it simple to understand the material’s underlying crystallography. Analytic tools are integrated for easy cross correlation of results from multiple analyses. OIM™ Data Analysis is the first microanalysis package written for 64-bit processing and Microsoft® Windows 7 compatibility. This permits the analysis of very large scan files, including datasets one order of magnitude larger (greater than 40 million data points) than those processed on current systems. Highlighted data can be filtered into a partitioned data set for separate analysis. OIM™ Data Analysis provides a comprehensive set of analytical tools that allows the user to investigate maps, charts, plots, and textures side-by-side. This comparative analysis plus OIM™ Data Analysis’s unique interactive highlighting capabilities provide unparalleled data-mining options. Highlighting is exceptionally useful to perform interactive data analysis by relating quantitative and qualitative assessments with specific microstructural features. Simply highlight the region of interest in an open window and the corresponding data points are immediately displayed on the related maps and charts. Once highlighted, the data and associated microstructural features may be partitioned as a new dataset for individual analysis. OIM™ Data Analysis resolves material structure closer to the grain boundaries than any other EBSD product on the market. The triplet voting method, paired with our patented Confidence Index calculation, provide superior pattern separation and positive indexing at the grain boundaries. A grain boundary map can be generated by comparing the orientation between each pair of neighboring points in an OIM™ Data scan. A line is drawn separating a pair of points if the difference in orientation between the points is within a specified range. A wide variety of maps, charts, and plots are easily generated from within the OIM™ Data Analysis software, giving unique insight into the material’s microstructure. The most commonly used graphical representations are quickly accessed from the QuickGen Toolbar, which is conveniently located on the OIM™ Navigation Bar. Typical data analyses include orientation (IPF map), texture-pole figure, misorientation boundary analysis, and a chart displaying a misorientation angle comparison. An almost limitless selection of maps is available. The maps can either be created from the menu bar or by using right mouse clicks on datasets displayed in the Project Tree. The QuickGen Toolbar offers easy access to EDAX OIM™ Data Analysis software’s most frequently used EBSD functionality. Its one-button operation provides complete analysis with a comprehensive template library. User-definable templates can be activated for the processing routines and graphical representations typically used in a particular laboratory. Complex analyses can be recorded for future application to EBSD datasets. The QuickGen Toolbar fulfills the needs of the novice user while providing the customizable features demanded by advanced professionals.